Small wonder the world struggles with obesity. The world is obscenely calorific. Calories are everywhere. Restaurant salads can have over 1,000. Kids' meals even more and with our supersized foodscape, almost nothing is safe. So let's shift gears and talk money. Let's pretend you got dropped into an exotic foreign country and while there were price tags on everything, you didn't know the exchange rate. Sure you might know that more was more expensive, but could you really be sure you weren't overspending? Or how about if you got hired for a job but weren't told your salary. How would you budget your monthly expenditures? In a survey conducted by the International Food Information Council Foundation (a Big Food funded organization), only 12% of those surveyed knew how many calories they burned a day. What that means of course is that Americans (and probably it's a finding that's true the world over) don't have a clue how many calories they need in a daytime, and so even though calories are posted on nutritional facts panels and in some jurisdictions even on menu boards, how are they going to do any good? These results should serve to alert allied health professionals and public health officials that in the absence of an anchoring statement regarding how many calories a person needs, initiatives like mandatory menu labeling will fall deaf on ignorant ears. 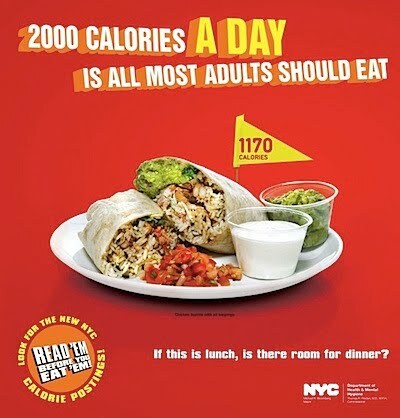 What we really need are public health officials to provide us with a Calories 101 campaign (like the one in the photo up above from New York's forward thinking, "Read 'Em Before You Eat 'Em" campaign) because if people don't know how many they've got to spend in a day, how can they possibly be expected to navigate our increasingly obesogenic food environment?